I enjoy the limited edition Hershey’s Kisses so much that I bestowed the silver medal to them on my Top 10 Best Spinoff Candy list. The varieties they release arenâ€™t always amazing, but when they are, they are. Lately, there havenâ€™t been very many releases since the 100th Anniversary passed, but every now and then I see a new flavor on the market that I eagerly purchase. For Halloween, they have reissued Candy Corn Kisses (no! ), Caramel Apple Kisses (I havenâ€™t been able to find these), and Pumpkin Spice Kisses (on sale this week at Target for two dollars a bag). Oddly enough, the same day I came across the Pumpkin Spice Kisses, I happened to spot Raspberry Special Dark Kisses at Walgreens. There was nothing Halloween or Autumnal about this bag to indicate why it was being released at this time, but one should not question gifts from the candy gods. The bag design for these is wonderfully decorative for Halloween without being gimmicky. I ripped open the plastic seal and my nose was inundated with the smell of pumpkin pie, nutmeg, and cinnamon. Wow, I thought. If these things taste half as good as they smell, I am in for a real treat. 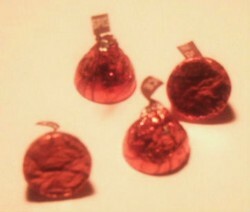 The kisses themselves are in orange foil accompanied by dark brown streaks, giving the impression of a tiger. When unwrapped, they display a muted but pretty orange shell, which leads me to assume they’re white chocolate, as it would be hard to get something with cocoa butter that shade (also reinforced by the ingredients list). Sliced in half, one can plainly see a white filling, not unlike the cheesecake Kisses. As I have mentioned before, I am a big proponent of consuming candy at different temperatures. Kisses are great chilled in my opinion, so I popped a few of these in the refrigerator and freezer to see how each version stacked up. Room Temperature: The cream inside is throat-burning intense, but tastes great nonetheless. The entire piece is soft and tastes like pumpkin cream cheese. Chilled: A little colder, the shells on these babies have a bit more bite to them, which I enjoyed. I could taste more pumpkin components here, and though the cream center was rich, it was not overpowering. Frozen: The shell is crunchy like a Hersheyâ€™s Kissable, which I texturally enjoy juxtaposed with the softer center. The creaminess doesnâ€™t melt all at once in your mouth, instead spreading with beautiful waves that layer the savoriness. At even colder temperatures, notes of apple, allspice, and honey entered into this piece, really hitting home the â€œspiceâ€ part of the name. The piece tasted like a fantastic piece of pumpkin cheesecake (which there is a recipe for on the back). Easily the best way to consume of the three. Overall, these were great, regardless of the way in which I ate them. I highly recommend these to anyone, but if youâ€™re a fan of pumpkin, this might possibly be the best candy you tasted in a long time. The Raspberry Special Dark kisses do not display a limited edition logo on the bag, but then again, neither did the Pumpkin Spice. The bag here is less ornate and more sophisticated, in what I assumed was an attempt to play up the whole â€œDark Chocolate is an Adult Candyâ€ perception. When opened, the aroma from this bag is pungent, as the smell of dark chocolate with a fruity twist pervades the nostrils. Room Temperature: The dark chocolate here is the main flavor, conveying a subtle raspberry tang, but noticeable nonetheless. Chilled: The piece has a harder bite to it, and when cold, the intensity of the cocoa dissipates, allowing for more of the raspberry flavor to percolate the candy. Frozen: This was very crunchy, something I enjoy and donâ€™t typically expect from a Kiss. The raspberry overtones are boldest here, while the dark chocolate is more contained, almost to the point of hitting the bitterness chocolate has when it’s in the 80% and above cocoa content category. I enjoyed this one the most. These were not as satisfying as the Pumpkin Spice. It wasnâ€™t that they were bad, but I have two issues with this flavor. One, raspberry is an awful flavor to try to mimic. Itâ€™s not that they do it badly, but real raspberries are so delicate in taste that they are almost impossible to reproduce. The result is always an imitation that is never as good as the real thing. Second, the dark chocolate in this resembled more of a ganache than it did a regular piece of chocolate. I like ganache, but it only succeeds when it coats something; an entire piece of it isnâ€™t balanced. 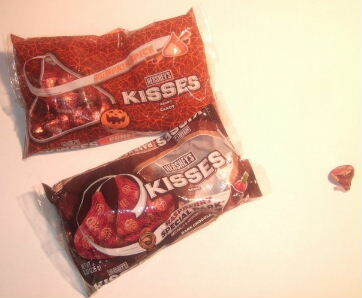 Overall, these are two promising additions to the Hersheyâ€™s Kiss lineup. People of all ages will go gaga for the Pumpkin Spice (mental note, hoard a yearâ€™s supply of these from Day-After Halloween Candy Sales); though itâ€™s possible for younger people to like the Raspberry Special Dark, they are constructed more for an adult pallet that doesnâ€™t crave a sugar intensity, resembling the dark chocolate philosophy maintained in Europe. Itâ€™s a more complex flavor than the Pumpkin Spice, but sometimes it pays to have the taste buds of a first grader. I haven’t seen the Raspberry Special Dark Kisses! Does anyone know what stores they sell them at?! 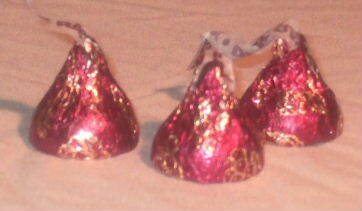 I ADORE the pumpkin spice kisses they are so very good i need to stockpile for when they are off the market. and if you want to try the caramel apple the only place i have seen them is walmart. I was first introduced to these delicacy today. I was delighted by the bright packaging and cute foil colors that complemented the bag. When I bit into the shell, I was bombarded with a jolt of flavor that pervaded into my olfactory glands and sent a tingle down my spine. PUMPKINS 4 LIFE!! wow. so many great reviews about the pumpkin spice kisses! i guess i need to try them. i love anything pumpkin, so i imagine i’ll enjoy these too. little pumpkin pies? that sounds promising. The Pumpkin ones kick A$$! They are DANG good! Philly, I found mine at Walgreens. Philly, if there isn’t a Walgreen by where you live, then the only thing I can suggest is ebay. I found them on there as well, and if your willing to pay a little extra to get them, you should be fine. Val, I found mine at Target. You’re dead on… the pumpkin spice is to die for! I just found some Cookies ‘n’ Cream kisses at Walmart. If you liked the Hershey’s Cookies ‘n’ Cream bar, you’ll like these- they’re pretty much the same thing only in kiss form and smaller cookie pieces. Whoops- spoke too fast. The cookies are actually just brown nonpareils, but the kisses are still good.